There’s a Wisdom that flows through us. It the same Wisdom that sings in the voice of these birds. That grows these tremendous trees. A Wisdom beyond what we can possibly imagine. It is the creative intelligence that creates crazy fish and incredible insects. And it is the voice in our Hearts and when we listen it will guide us on. It’s like a flowing stream that knows just which way to go. My name is Maryjane. I’m sitting in a streambed. Not long ago, rushing water carved these banks. Now all gone. It feels like a very secret intimate space to enter into. It’s a bit like going to somebody’s bedroom when they’re not there. The Power that rushed along this streambed is visible in the big branches that are just left strewn here and in the deep carved banks, in the large piles of gravel that are being carried along. And now the water has gone completely. That tapping sound is a woodpecker in a tree just above. As we go along in our ordinary lives we completely forget that we are built of such incredible Power and Possibility. 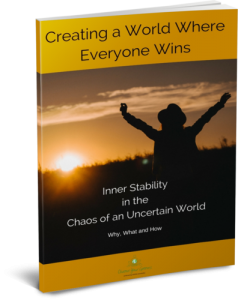 As we see the world around us and listen to the daily news, we develop expectations of the world and we react to the world in habitual ways. 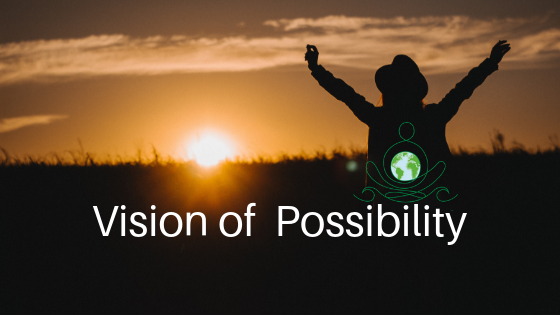 what if, we could feel that Power of Possibility, that Wisdom of incredible creation in our Hearts. world that we see around us now. Beyond the expectations given to us by the media. What if we could see so clearly the Vision in our Hearts of a World where everybody has enough. What would it feel like – a world where everybody, everybody has enough. What would you see outside your window? In your streets, in town and city. are cared for by the neighbours. And they are points of gathering to harvest the fruit together. I imagine the growing of food to be an intrinsic part of every business of every school, of every care home. It doesn’t have to take a lot of work. Perennial food is food that you plant once, and it gives year after year like a fruit tree or a grapevine or a herb bush or raspberry canes. There are many, many plants that could be put into place and with the little care and attention, transform the environment. Flowers would grow on these perennial plants attracting butterflies and bees and other insects. Birds would gather, and bird song would start to fill the streets. Hot hard concrete surfaces would have areas of shade and green. Bringing relaxation to the Heart and the mind and the eyes and the body. And there would be nutritious food that required no packaging, no transporting, no selling but just freely available for everybody around. It’s not just the streets, it could be balconies and the rooftops. It could be in areas that are now broken degraded concrete of forgotten factories. It could be on a pot of your window sill. Today, it’s not too late to plant a tree. Hold the Vision, feel it in your Heart. May it inspire your actions, your thoughts, your speech, your interactions and together we can create a World where Everybody has Enough.